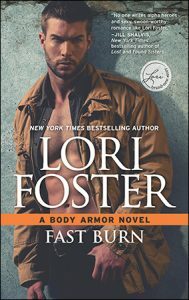 "...Fast Burn is a fast paced, energetic and suspense filled story of revenge, power, secrets and lies. 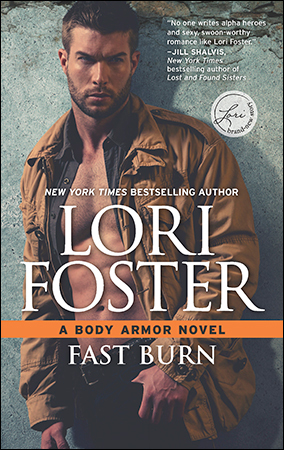 The premise is spirited, powerful and driving; the characters are rugged, determined and colorful; the romance is seductive and passionate.Fast Burn is an electrifying and dramatic story about two people pulled together by circumstance, attraction and love." 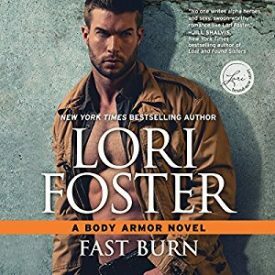 "...Lori Foster, once again ‘thank the stars’ brings us a sensational story with suspense, sarcasm, blistering hot touches, and the strangest of circumstances..."
"...well paced, with sexual tension that oozes from the page. I quite enjoyed the conclusion to this series, and look forward to seeing what Ms Foster comes up with next..."
"...the book is amazing! So if you want romance, suspense and action to keep you entertained, I highly recommend this!" She’d made a point of surrounding herself with some of the finest male specimens on the planet—professional fighters that she’d turned into prime bodyguards, each of them in high demand. It was her vision for Body Armor, to get rid of the stuffy Men in Black clones and offer instead real men, with real muscles, certifiable machismo and lethal ability with or without a weapon. No, she didn’t fire the previously established bodyguards; that would have been disloyal to her brother, who’d hired them. She simply reassigned them to the more boring cases, and overall they were happy with that. Anything to do with a celebrity, a dignitary or a politician her elite team now covered. Enoch was on the small side, five-two, slight of build, with average brown hair and eyes. It was his keen intelligence and attention to detail that made him so perfect at his job. But his size didn’t really matter when he stood next to a man who made most everyone seem small, her included. Brand was a big and badass professional MMA fighter with a solid steel frame of muscle all wrapped up in a cocky attitude. Yes, she always spoke her mind. Why not? She was the boss and her employees knew her interest in them wasn’t personal. Of course, Brand wasn’t yet an employee. Elation conflicted with disappointment. There were times when she hoped they could take a different path from employer and employee, one more personal, intimate. “Perfect.” She tried to be excited, but it wasn’t easy. Her stomach bottomed out. This felt too much like losing, and by God, she did not lose. Determination stiffened her spine. “Tell me what it is you need.” More money, obviously. She could swing that. “Designated time off? Better benefits for dependents?” Working around that would be trickier, but she’d figure it out. Was he genuinely interested or just trying to move past her obvious irritation? Not that she’d stay irate long. It was a waste of time. She was more about positive forward strides. Dear Lord, was that a blush she felt on her face? She didn’t embarrass easily—except that he’d nailed it perfectly. How many times had Scott remonstrated her for being too pushy? She wished she hadn’t worn her hair in her usual classic up-do. With her nape exposed, the heat of his breath sent swirling sensations to riot in her belly. Damn him, did he really have such a low opinion of her? Maybe he didn’t like her. That was something she’d never considered. She got along great with the other bodyguards who were all friends with Brand. Or…did they feel the same way, too? Did they humor her in person while resenting her the rest of the time? Scott had told her to quit harassing the clients—but she didn’t feel like sharing that part. Although, seeing Brand’s expression, she’d bet he already assumed as much. He seemed to know her too well. Better than anyone else, in fact. Now Brand frowned, and she loved how intimidating he looked. He’d make an ideal bodyguard if only he’d realize it. The assurance that he didn’t consider her stupid would have been nice, except that the moment he’d touched her, her thinking faltered. So did her breathing. And her heartbeat. Just that simple touch, his warm fingers brushing over her bare skin, on her arm, and her priorities got all mixed up. 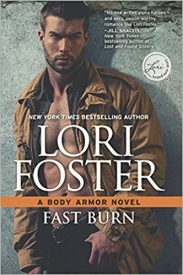 At five-eight, she wasn’t exactly petite, but Brand still stood half a foot taller, and next to his chiseled bulk, she felt downright dainty. His hold was soothing, but the last thing she wanted from him, from anyone, was pity. “The little girl, Mari, screamed from the gunshot, but she never saw the body. Soon as the guy hit the ground I scooped her up and got her out of the room, telling her it was just a loud noise.” Sahara could still remember the thin arms clinging so tightly to her neck, the shaking of that small body and the soft sobs after the scream. Until that day, she’d never thought about having children of her own. She missed Mari a lot. “Ouch,” Brand said with smiling satisfaction. Without a smidge of regret, he said, “No,” and then his mouth was on hers, his lips pressing, his tongue touching until she opened. The second she did, his tongue slid in and she melted against him. God help her, it was incendiary.